Check out this 12" Stovetop Grill-Oven Pan By MasterPan - Micro Ventilated Lid for $32 (Retail $50) + Free Shipping. -Low and Wide Grill Ribs: Allows for multi-use so you can grill but also stir fry and sauté food. Use as grill pan, fry pan or as a casserole. -Stovetop Oven: Steam releasing, heat trapping lid retains heat on the inside but releasing steam at the same time to avoid condensation on the inside. 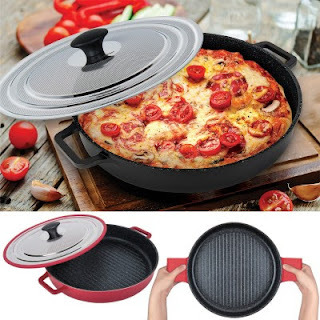 Creates the perfect oven-like feeling on the inside keeping fried food hot and crispy. -480 degrees Fahrenheit without the lid. -Cook n' Serve: Beautiful interior and exterior finish lets you go straight from stove top to table top. It's a pan and a serving dish all in one. The Lid will help keep food warm yet crisp. -Superior Non-stick and Stain resistant: MASTERPAN uses ILAG's GRANITEC triple layer non-stick coating which is PFOA and heavy metal free. Food comes right off the pan so it makes cooking more enjoyable and easy. ILAG Granitec is a multilayer, ceramic reinforced, scratch-resistant non-stick coating for demanding home use. -Includes removable silicone grabbers to protect hands from hot pan handles.